Located off of Vermont Route 9 on the eastern face of Mt. Olga, Hogback was once a popular regional ski area. The groundwork for the Hogback development dates back to the 1920s, when Harold White became interested in an area below Mt. Olga. After acquiring some land, he developed a gift shop and restaurant atop the newly established Molly Stark Trail scenic byway, taking advantage of tourists stopping to cool their cars while admiring the long reaching vista. The Skyline Restaurant, Hogback Mountain Gift Shop, and subsequent Marlboro Inn businesses remained under the ownership and management of White's children for many decades. Lift served skiing on Mt. 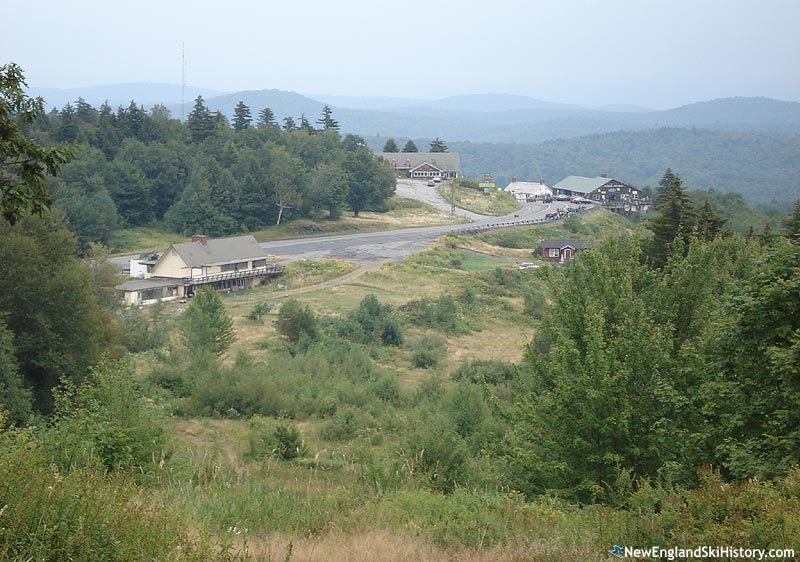 Olga dates back to the 1946-47 season, when a $50,000 T-Bar development was opened by the Hogback Mountain Company, Inc. (or Hogback Mountain Ski Lift, Inc.). Brattleboro Outing Club members John Dunham, Floyd Messenger, and Les Billings served as the company's President, Tresurer, and General Manager. In the days prior to snowmaking, the advertised 1,900 foot base elevation was deemed particularly attractive to skiers. Bus service was provided from Brattleboro. The T-Bar lift likely opened in January of 1947 and was soon advertised as the highest capacity T-Bar in the East. For Hogback's second season, the rope tow serviced Practice Slope was added on the Route 9 side of the area. In addition, the intermediate Ripperoo trail was cut adjacent to the T-Bar. 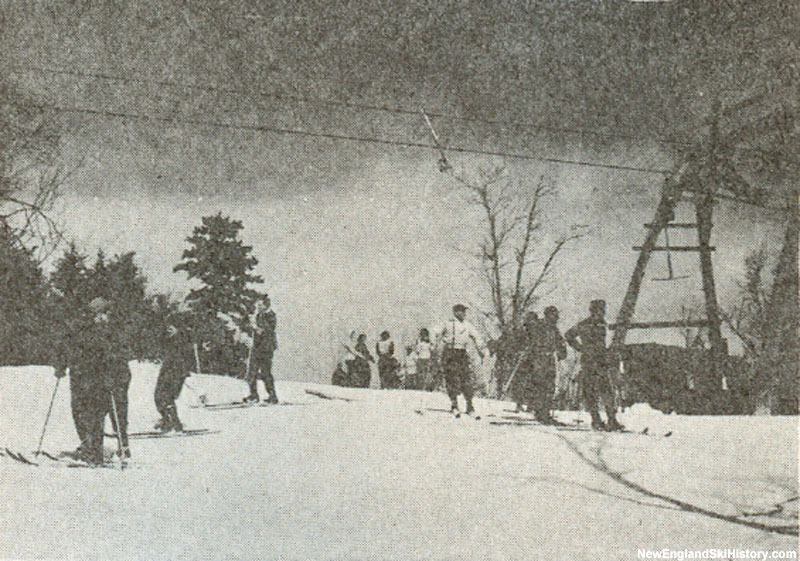 The rope tow was extended for the third season, while the Sugar Slope was added. Though there had been talk of expanding onto the South Face, the project never came to fruition. After half a decade of operation, the ski area reportedly turned its first annual profit with the 1951-52 season. Following its most successful season to date in 1954-55, Hogback added the diesel powered 1,700 foot long Whiteway Pomalift and two new trails, giving it additional visibility from Route 9 and increasing its vertical drop by about 50 feet. By this point, over a thousand skiers would hit the slopes on a good day. The Alpenglo Lodge was completed for the 1961-62 season. Located at the base of the Practice Slope, the facility had a cafeteria, restrooms, and a large fireplace. Hogback's next significant expansion took place in 1964, when two more T-Bars were installed. The Twin T-Bar was added to the original part of the ski area, taking some stress off the aging Constam T-Bar. The Alpenglo T-Bar was constructed between the original ski area and the Poma lift served complex, not too far from the Skyline Restaurant. By 1970, the area was just about fully built out, sporting 4 T-Bar lifts. The original Sugar T-Bar was damaged around this time and replaced with a new Doppelmayr drive in 1971-72. With large areas such as Mount Snow and Stratton rapidly growing, Hogback attempted to differentiate itself by using the slogan the "biggest little area in New England." In the fall of 1978, Hogback was sold to Texas attorney Thomas Barlow. Arnold White remained on board as General Manager. Plans were announced to install a large snowmaking system for the following season, however the project did not come to fruition. Rising expenses and a lack of snow resulted in a multi-year closure in the early 1980s. The 1985-86 season reportedly generated less than $100,000 in revenue, while its insurance company wanted more than $100,000 just for liability insurance. 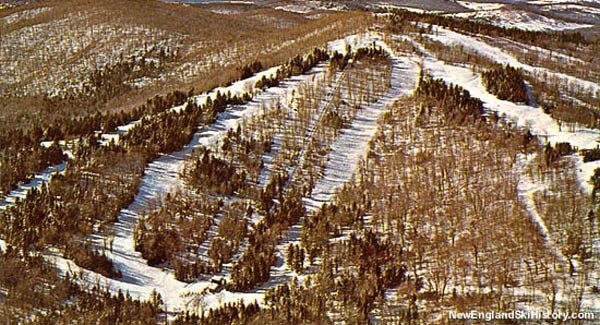 As a result, Hogback decided not to open for the 1986-87 season and instead closed for good. Hogback Ski Area, Inc. was formally dissolved in 1992. In 1993, Dan Purjes reportedly purchased Hogback for $1.8 million. 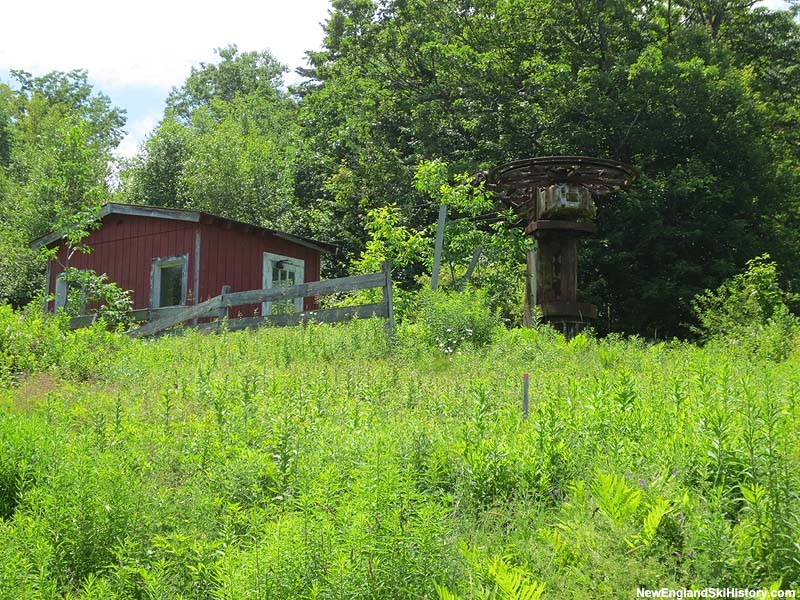 In the late 1990s, the then-owners of Ascutney attempted to form a corporation that would have reopened Hogback, however the planned IPO was unsuccessful. In 2006, the Hogback Mountain Conservation Association was formed by local citizens with the intention of saving the land from development. After a multi-year fundraising effort, much of the land was handed over to the Vermont Land Trust, Vermont Housing and Conservation Board, and the Town of Marlboro in 2010. Some trails are now maintained for hiking and snowmobiling, as well as access to the nearby Mt. Olga fire tower in Molly Stark State Park. The Hogback Mountain Gift Shop remains open, while the Marlboro Inn is now home to the Southern Vermont Natural History Museum. "I learned many life lessons at Hogback. I worked there many years in the gift shop and the ski shop. Summers I’d ride my horse up the ski trails. Was the best place to grow up. Sure miss it there. " "I loved skiing at Hogback as a kid!! 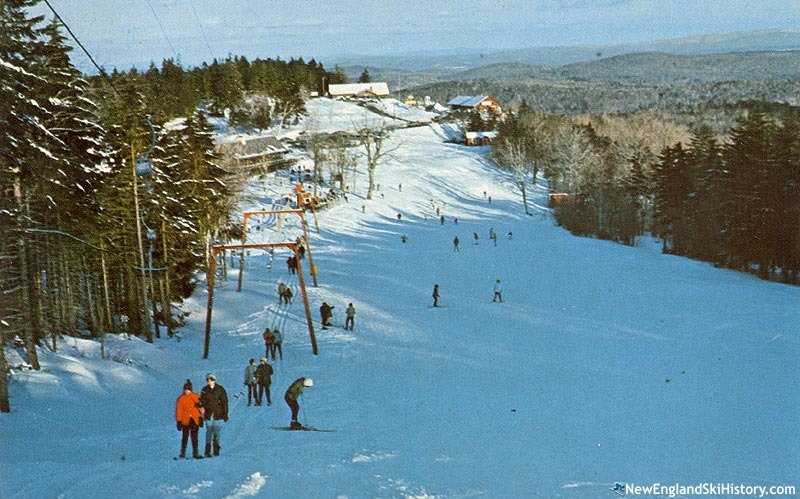 West Halifax used to have a ski day every week at the mountain. Living on Shearer Hill Rd, my parents would drop us off on Grant Rd and we'd have to ski in thru the woods. I remember some amazing skiing on Razorback after a big snow storm! Great memories on that mountain! " "We skied at Hogback a few times in the mid-late 60s. Most of our Vermont skiing was a Maple Valley, Haystack, Mt. Snow and Okemo. Hogback was a good beginner area. I remember taking my cousins there when they were just learning. It was a novelty to have the base at the summit. I think the last time I skied there was 1969 with a high school ski club outing. Good little area! " "I grew up skiing and working at Hogback. I worked in the ski shop and the gift shop. My mom was the bookkeeper for Arnold. Was a great place! " "Skiied Hogback as a child! Loved every minute! From buddy warner, to cutting way out and having lunch off Meadow run, my brother missing last T out of "the hole" having to hike out! Such great childhood memories. Went back around 1994. Some dam kids had been partying and throwing T-bars thru some of the old posters and decore, shame. So glad to hear it is getting the respect it deserves! It is hard for many kids to say we skied down hill and up!" "I skied at Hogback in the late 50's the 60's. Took the BOC Bus on Saturday from the Paramount Theater. I was also on ski patrol at Hogback in the 60's. Lots of great memories." "I skied there a few memorable times my Mom and Dad were great friends with the Whites. I love small ski areas and wish they could continue." "I skied Hogback all through the 1950's and into the 1960's. Every Saturday and sometimes Sunday's there was a Brattleboro Outing Club free bus that took all of us kids up the mountain for a day of "free" skiing. We had to pack the slopes when we got there if there had been snow, but oh the fun! The Rip and the Sugar were favorite trails, but they were all fun with friends and even girl friends later on. At the end of the day we climbed the slopes and came down on 'jackjumpers' with the crews. Best skiing of my life!" "I skied at Hogback from '72 until '80 (I was age 8-16). It was a wonderful place for my family to go to and we would visit it 3-4 times a year from Philadelphia. Thurs/Fri and Mondays, we would ski Mt. Snow or Stratton, but on the weekends it was Hogback. In the picture looking down the practice slope, you can see a small reddish cabin in the right center of the photo. That is where our family used to stay as we were friends with the family that rented it for years. Such very fond memories of skiing there. Favorite trail without a doubt-- Ripperoo!"